Some of the best incident light meters, including a good used option. For more information, read my article The Best Incident Light Meters. 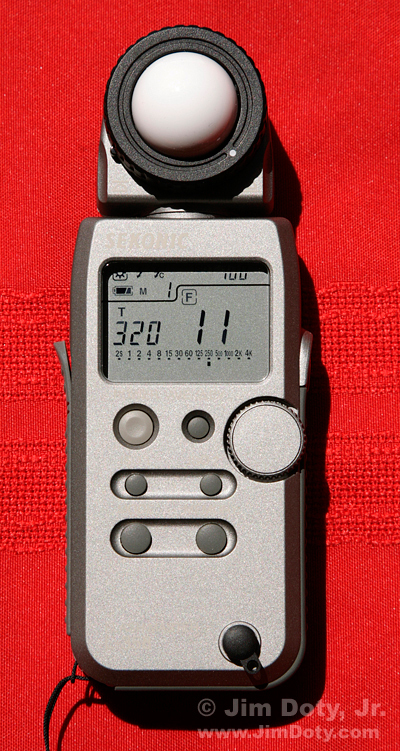 Sekonic L-478DR-U Pocket Wizard Lightmeter. If you intend to use this light meter with Pocket Wizard remotes to fire studio flash units, get this model. New Sekonic L-478D-U Lightmeter. If you do not intend to use this flash with Pocket Wizard remotes, get this model. Sekonic L-358 Flash Master Light Meter. This is my favorite light meter. Even though it has been discontinued you can still find it used at Amazon. Sekonic L-308S-U Flashmate Lightmeter. This is a good choice for a less expensive alternate to the Sekonic L-478 models. Gossen Digipro F2 Light Meter. This is an excellent Gossen meter. Gossen Sixtomat F2 Light Meter. This is a good choice in a less expensive Gossen option. Page created November 18, 2017. Updated May 4, 2018.